A sense of deep unease has settled on the defence community of the United Kingdom, if indeed any such collective description could be applied to the UK’s Armed Forces, their supporters in the general population and the various industrial enterprises that depend on them. Often they have competing concerns, not least the Navy, Army and Air Force, which are bound to fight their own corners. The infighting may increase, for in the wake of the Conservatives securing their first majority government since the early 1990s, there looms on the horizon another Defence and Security Review (DSR). It is a sequel to the disastrous SDSR of 2010, which cut away whole areas of British defence capabilities and whose effects are to this day making it very difficult for the UK to be taken seriously by allies or feared by enemies. The Navy suffered grievously in SDSR 2010, it was claimed by some due to dirty tricks by the RAF, which sought to secure its Tornado bombers at the expense of the Navy’s strike carrier capability. Five years on the government presided over by Prime Minister David Cameron and Chancellor of the Exchequer George Osborne, seems intent on shaving billions more off the defence budget. It risks further damaging the UK’s ability to defend itself or vital security interests at home and abroad. Cameron and Osborne seem unconcerned that the RAF’s contribution to combating the ISIL terrorist group has been pathetic, amounting to a handful of elderly Tornado bombers that have achieved little. Nor are they seemingly worried that the Army can barely scratch together a combat brigade to bolster NATO’s central front against a resurgent and cockily assertive Russia. The Navy finds it difficult to deploy more than one attack submarine, while only one of the new Type 45 destroyers is allegedly on operations. There will also be no strike carrier capability until the 2020s (if not longer). Meanwhile, Russian submarines find their task of snooping around British waters easier due to the complete absence – unique among leading maritime nations – of a proper Maritime Patrol Aircraft (MPA), another capability axed under SDSR 2010. Some frigates allegedly have their speed restricted due to a lack of spare engines. Others are borrowing the engineers of foreign naval services to keep going. There are claims, denied by the government, that the nuclear deterrent submarines are in a dreadful state and struggling to maintain the much-vaunted Continuous at Sea Deterrent (CASD). Until the Cameron-Osborne duo took control of the British ship of state, it had been world-renowned for projecting military power and influence to show a lead, especially on the high seas. Their SDSR 2010 was a catastrophic turn of events, enfeebling the British armed forces in ways they seem unable to comprehend, as evidenced by their continual boasting about increasing investment in future kit, but meanwhile sapping the operational strength and actual front line capabilities. Royal Navy warships are now absent from NATO task groups they used to lead, spend little time in guarding British overseas territories and, it is claimed, cannot respond to some additional commitments due to a lack of personnel to operate them. They have in the recent past put to sea with vital sensors and weapons functioning at a minimum level due to lack of funds for essential maintenance and stocks of ammunition. An assault ship that would be ideal to save migrants lives in the Mediterranean, or spearhead a new rapid reaction force in the Baltic to counter fears of Russian aggression, is in mothballs due to lack of funds and people. Royal Fleet Auxiliary support vessels cannot put to sea due to lacking mariners to sail them. Above all what is missing is the political will of the UK government to use the Royal Navy properly and fund it accordingly. The Cameron administration refuses to guarantee the minimum two per cent of GDP on defence spending required by NATO yet ring fences overseas aid, which is often of dubious effect and does little to deter the UK’s enemies. Cameron and Osborne could be described as living in a state of naval defence denial, yet the suspicion is for all their fine talk of investing in maritime forces, they simply don’t care about Defence in any deep or meaningful way. The hard power world around them is reading one script and they are using another. It is telling that they feel the minimal effort currently being made in Defence is enough when it falls very far short of what the UK really needs in an era of turmoil and anarchy in international affairs. Threats are multiplying every day and it is not that Cameron and Osborne lack warnings from well-qualified people, it is just that they prefer to ignore them. They simply do not feel Defence is important to their political fortunes and therefore it does not matter. Former First Sea Lord, Admiral Lord West of Spithead issued stark and unambiguous warnings on the state of the UK’s defences in the House of Lords. Lord West said that since 2010 there has been a 9.5 per cent reduction in defence expenditure, which has created a 30 per cent reduction in UK military capability. He suggested that the effectiveness of Britain’s soft power and the country’s position in the world relies in turn on credible hard power. It is a burden that a government in a state of denial over Defence is unlikely to pick up, though there are likely to be boasts about new investment in strike carriers and frigates, while ignoring the ugly truth that it is all too little. Too few: The Duke Class (Type 23) frigate HMS Kent returns home to Portsmouth after a deployment to Middle East waters. She is one of only 13 frigates left in the UK fleet’s order of battle after years of defence cuts. A precious capability due for the chop in the 2015 defence review? 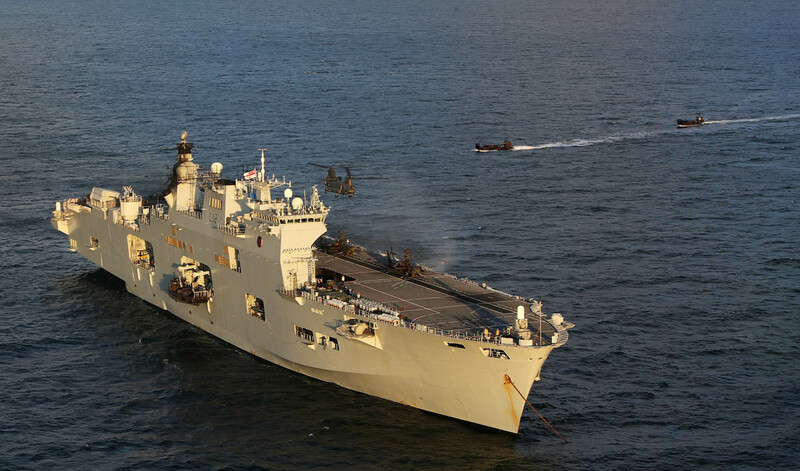 Landing craft return to the assault carrier HMS Ocean during BALTOPS 2015. There are fears the UK’s current impressive amphibious warfare flotilla is about to be cut back even further. Photo: Lt Sarah E. Burns/ US Marine Corps.